ANA, Japan’s largest airline, announced today the inaugural flight of the final of three aircraft decorated with special Star Wars livery. 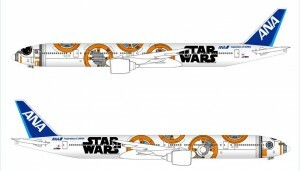 Part of the previously announced ANA STAR WARS™ Project the last aircraft, the BB-8™ ANA JET (Boeing 777-300), featuring the new character from the movie Star Wars: The Force Awakens, will roll out on March 27 and commence international routes. ANA is the largest airline in Japan by revenues and passenger numbers. Founded in 1952, ANA flies today on 81 international routes and 112 domestic routes. The ANA group has 35,000 employees and a fleet of about 250 aircraft. In FY2014, it carried 50.4 million passengers and generated revenues of 1.71 trillion Japanese yen. ANA has been a member of Star Alliance since 1999, and has joint-ventures with United Airlines on trans-Pacific and Asia routes, and with Lufthansa, Swiss International Airlines and Austrian Airlines on Japan-Europe routes. Its Frequent Flyer Program, ANA Mileage Club, has more than 26 million members. ANA was voted Airline of the Year for 2013 by Air Transport World Magazine, and in 2016 was awarded five stars for the fourth consecutive year by the world’s leading Airline and Airport review site, SKYTRAX. ANA is the launch customer and biggest operator of the Boeing 787 Dreamliner.